CASE: 38mm, stainless steel, antimagnetic. Seahorse, PAF and serial number engraved on case-back. CONDITION REPORT: The dial shows signs of aging with a beautiful brown patina. The case is complete with its military PAF engraving and matching serial number. The antimagnetic movement cover as well as the washer is included within the case. 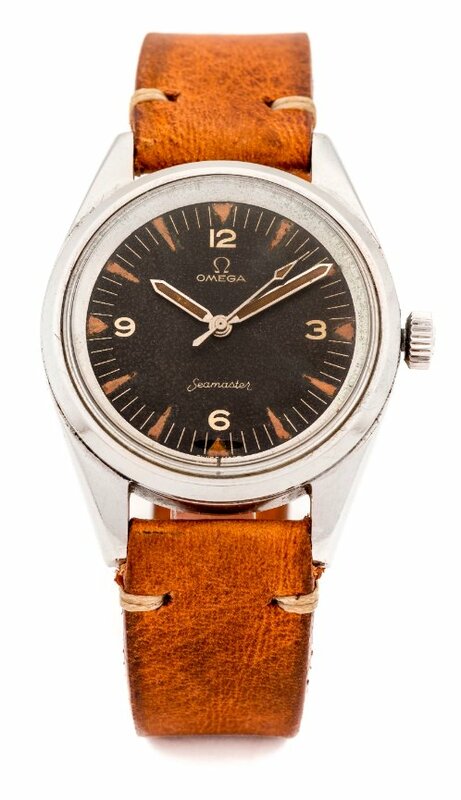 The Omega Railmaster ref. CK 2914, the predecessor to the 135.004, was launched in 1957. It was designed for professionals such as scientists, technicians and electricians working within close distance of powerful electric currents. This antimagnetic tool watch has a special 1mm (instead of 0.4mm) thick mat black dial, with luminous hour markers and either broad arrow or baton hands depending on the model. The movement of the Railmaster is encased in a mu-metal cage protecting the movement to 1000 Gauss. This was also the purpose of the thicker dial. This particular 135.004 Railmaster is a very rare version made for the Pakistan Air Force and has Seamaster (without 300) printed on the dial, which was unique to the Railmasters made for P.A.F. and a special order. This was also seen on Railmasters ordered by the Fuerza Aerea del Peru (FAP), which had Flightmaster replace the Railmaster name. The case back has a P.A.F. engraving underneath seahorse logo and the serial number of the movement is also engraved on the case back, which was typical on military wristwatches for inventory purposes.